Lloyds #DAX #NK225 The UK’s retail banks appear united in their approach to Brexit. Not a single one gives a clue to what’s coming! However, as #Lloyds Group big picture chart continues to show, this is perhaps not the case… Share prices are apparently stuffed. We’ve a problem when near term ambitions fail come to fruition as it generally implies big picture forces are in control. 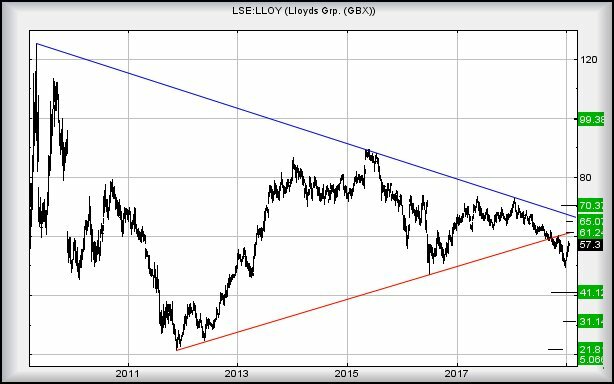 For Lloyds, we must presently take the approach of expecting weakness to an initial 41p with secondary, if (when) broken at a hopeful bottom of 31p. At time of writing, it’s trading around 57p, requiring above 61.25 to remove itself from the immediate zone of doom. What happens, should a miracle propel the price beyond 61.25p? Continued recovery to an initial 65p looks confident. And if this initial target is exceeded, our secondary for the longer term calculates at 70p sometime in the future, a point where a visual glass ceiling awaits. For now, there’s more to dislike about Lloyds than we’d prefer and it’s quite easy to suggest keeping a weather eye on the price, just in case 31p makes an appearance. At such a level, we would expect a serious bounce.